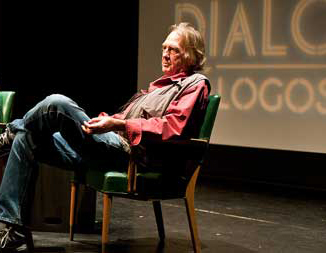 Charles Bowden at the Marfa Dialogues, Crowley Theater, September 2010. Author Charles Bowden died on Saturday at his home in Las Cruces, N.M. He wrote about the U.S.-Mexican border in magazines and books such as Murder City and Down By The River. Charles Bowden was an investigative journalist in a time when those words aren’t often strung together. He reported from Mexico and became one of the most notable chroniclers of the city of Juarez during its years of intense violence. As a writer, he was colorful, acerbic, and gave an intimately human perspective to the drug wars that was often missing in other journalistic accounts. U.S. politicians use the border for domestic political purposes in their districts. That’s why we’re building a wall. It is is multi-billion dollar fiasco, as if we can wall-out reality. The good news is that it will probably provide roofing materials for poor Mexicans as they laser-torch it in the night. But the wall is not an answer to the either the poverty of Mexico, American drug consumption, or the flight of the poor north. It’s simply a physical thing, so you can go home to your Congressional district and say: Message: I Care, I did something. The “War on Drugs” officially started under President Richard Nixon. We’re now more than 40 years into the game. Every drug is more available in the United States now than it was when we started it. Every drug is of higher quality. And every drug in real dollars is cheaper. This is a fiasco. Hamilton Fish, of the Public Concern Foundation, helped Ballroom Marfa host the first installment of the Marfa Dialogues and selected Charles Bowden as the keynote speaker. It was a huge privilege for us at Marfa Dialogues and in the Marfa community to have Chuck come through. He seemed to me at the time to be somewhat overwhelmed by the import of what he and learned, and how harrowing it was for everyday citizens in Mexico to be caught between the well-funded and politically motivated crackdown and the drug elements which were operating with impunity. And the victims were ordinary citizens. I think the reality of this injustice took a toll on him. Bowden won the Lannan Literary Award in 1996 and PEN Center’s First Amendment Award in 2011.